Welcome to our Perimeter of Right Triangle support page. We will explain how to find the perimeter of a right-angled triangle and show you some worked examples. When we are trying to find the perimeter of a right triangle, there are several different ways we can do this. Which way you select will depend on several factors, such as whether the shape is drawn to scale and whether the side lengths are given. This is the easiest example to deal with. All you need to do to find the perimeter of right triangle is to add up the three side lengths. 3cm + 4cm + 5cm = 12cm. So the perimeter of right triangle is 12cm. Option 2 - Side lengths are not given but the shape is drawn to scale. This is another straightforward example to work out. All you need to do is to use a ruler, measure the sides and add up the length of each of the sides. Note that you will often end up with a decimal answer for your perimeter. Option 3 - the shape is not to scale and the longest side is missing its value. To work this out, we need to use Pythagoras' theorem to find the longest side and then add on the lengths of the other two sides. 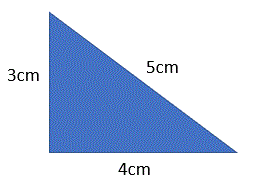 Use Pythagoras' theorem to find the length of the longest side and then add on the lengths of the other two sides. 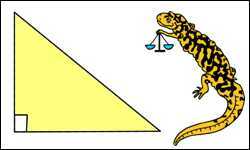 Pythagoras' theorem says that the square of the two shorter sides on a right triangle is equal to the square of the longest side (the hypotenuse). So if h is the longest side (or hypotenuse), then h2 = 62 + 32. So h must equal √45 which is equal to 6.71 to 2dp. The next step is to add up the lengths of all the sides. So the perimeter of the right triangle is 15.71cm to 2dp. So if h is the longest side (or hypotenuse), then h2 = 42 + 42. So h must equal √32 which is equal to 5.66 to 2dp. So the perimeter of the right triangle is 13.66cm to 2dp. Option 4 - the shape is not to scale and one of the legs (shorter sides) is missing its value. To work this out, we need to use Pythagoras' theorem to find the shorter side (or leg) that is missing and then add on the lengths of the other two sides. Use Pythagoras' theorem to find the length of the leg and then add on the lengths of the other two sides. 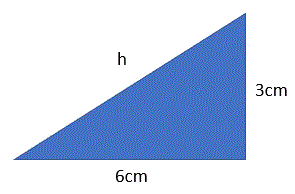 Find the perimeter of right triangle below. So if s is the leg that is missing, then s2 + 52 = 82. So s = √39 = 6.24cm to 2dp. The next step is to add up all the sides. 6.24cm + 5cm + 8cm = 19.24cm. So the perimeter of the right triangle is 19.24cm to 2dp. So if s is the leg that is missing, then s2 + 62 = 102. So s = √64 = 8cm. 8cm + 6cm + 10cm = 24cm. So the perimeter of the right triangle is 24cm. If you would like to practice these skills yourself, why not try our worksheets all about finding the perimeter of a right triangle. The first sheet involves measuring with a ruler only. The third and fourth sheets involve finding the perimeters of right triangles using Pythagoras' theorem with answers to 1dp. 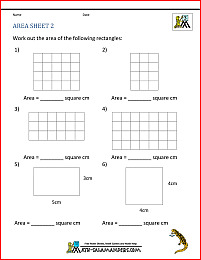 We have a selection of perimeter help and support as well as perimeter worksheets.